1. Barton Bistro. Run by an English Filipino woman, this place has delicious Filipino and English cuisine. The spaghetti bolognaise, pancit bihon, BBQ fish with rice and french fries are unreal. All of the pasta dishes can be easily shared between 2 people. They also have Happy Hour between 4:00 and 6:00. Beers go for 35p and cocktails are 2-for-1, which is a fantastic deal seeing as the price for one cocktail is 120p! Many backpackers congregate here for sunset drinks and food. They also have a kayak for rent and a dart board. Our favorite bar/restaurant – Barton Bistro. 2. 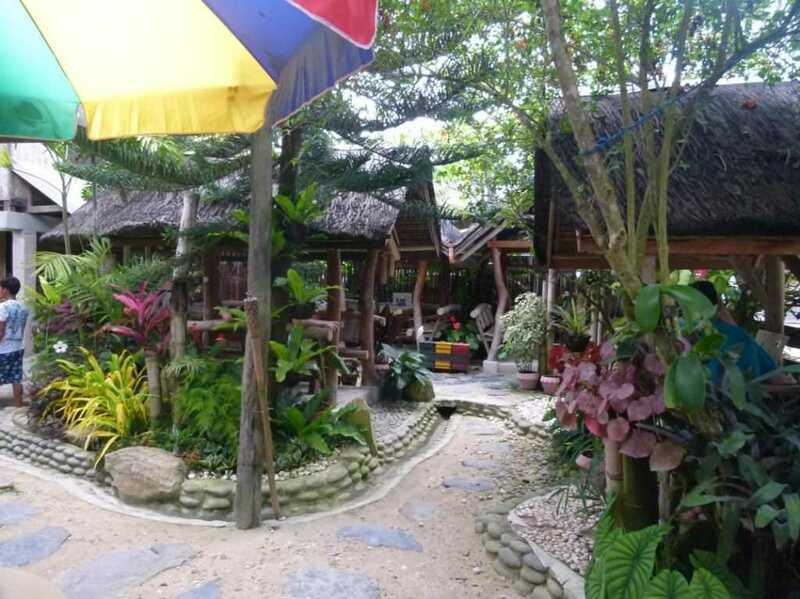 Ayette’s Bamboo Cottages. This place has some great prices and selection. The food here is amazing and it’s a popular place to eat. The BBQ chicken, adobo chicken and fried chicken are all delicious. They also have a Happy Hour between 3:00 and 6:00pm. The only downside is that this restaurant isn’t on the beach and that they have a caged monkey. Ayette’s Bamboo restaurant in Port Barton. 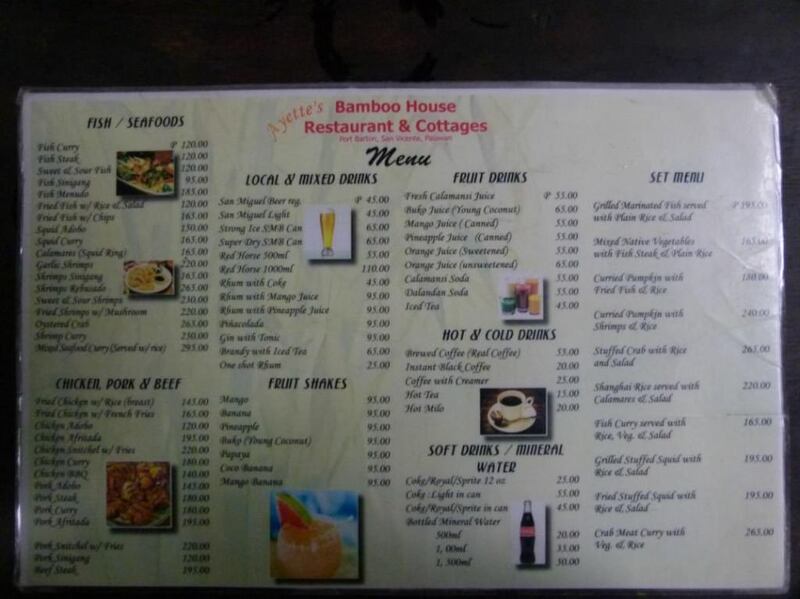 Menu for Ayette’s Bamboo Restaurant, Port Barton. 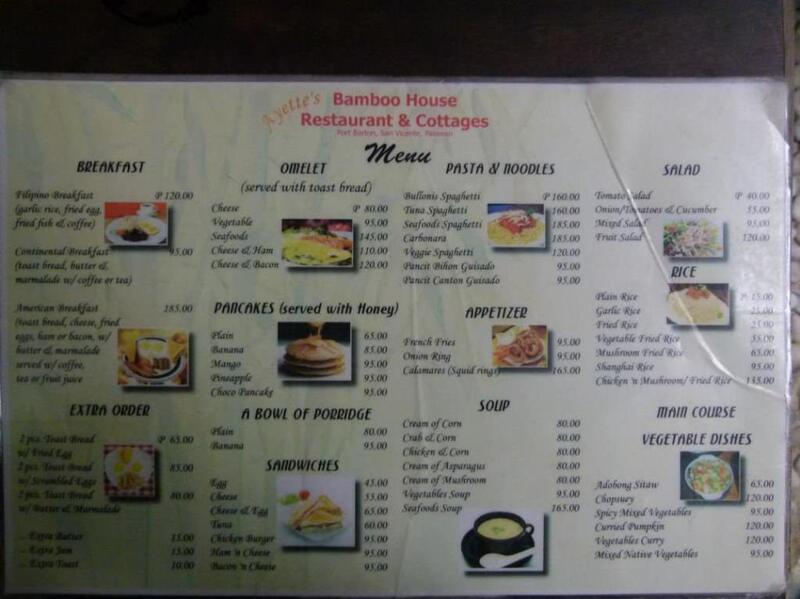 Backside of the menu for Ayette’s Bamboo Restaurant, Port Barton. 3. El Busero Inn. We ate our breakfasts here and one dinner. The breakfasts are a really good size and an even better price. Porridge with banana is 90p, 2 eggs, 2 pieces of homemade whole wheat bread and a banana is 95p. Apart from breakfast, we found the menu to be pricey. 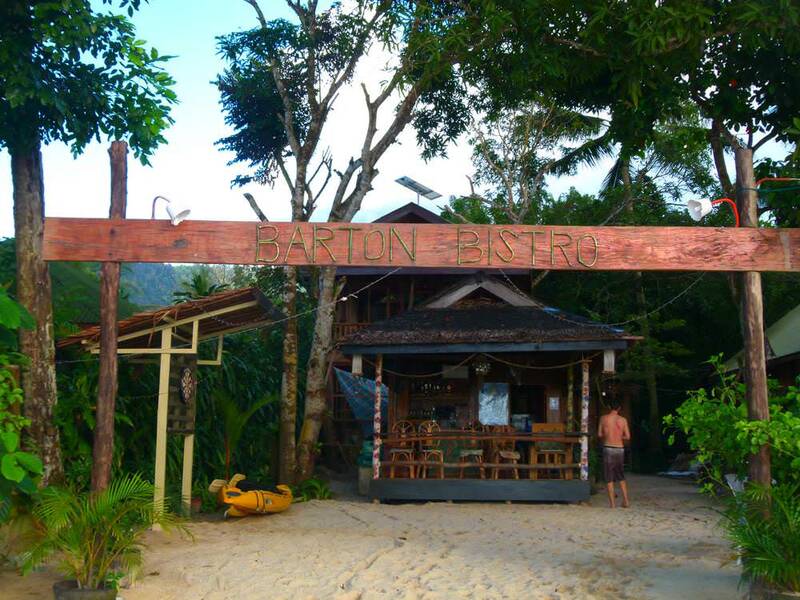 Hi, Barton Bistro is my Brother Rich & his Wife Pinky’s place, (I am in UK they are in the Phillipines, who got the best deal!). They plan to add some rooms so could also be a great place to stay soon. That would be a great idea. There’s not all that much lodging at the moment and they have a great location. We loved eating there…and the happy hour. Have you been? going there end of the month, well, in puerto princesa, but definitely going to san vicente/port barton. am working on our itinerary, and chanced upon your site. 🙂 helpful! salamat! Thanks for this great advice. We tried to follow your advice on places to eat in port Barton. We realize this article was written in 2012, but wanted to check it out anyways. Sadly, Judy’s place is now closed but found out she has a new spot in puerto called Sheebang Hostel. Also, there are lots of new places that have popped up over the past few years. The one spot I’d recommend is Mojitos Jungle lounge. Great spot to chill. Loved the food and cocktails. Very cool washroom too. Thanks for all your tips! Awesome! Thank you for the update. I’m glad you enjoyed Port Barton!